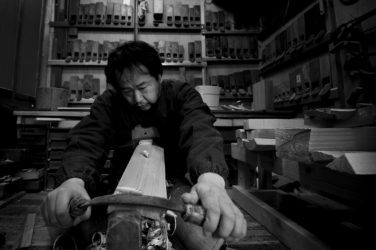 Two of the Kyoto artisans in the exhibition, Shokunin: Five Kyoto Artisans Look to the Future, Shuji Nakagawa (woodwork), and Chiemi Ogura (bamboo weaving), demonstrate their crafts and talk with visitors about their lives and their work. This exhibition features the work of five artisans from Kyoto each of whom works in a different medium, each with different background. All but the youngest artisan (and the only woman) in this group inherited their craft from generations past. Each of them is committed to carrying on their craft at the highest level of excellence while seeking ways to take those traditions forward into the current millennium.